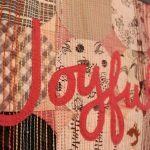 This is my second entry into the Bloggers Quilt Festival. 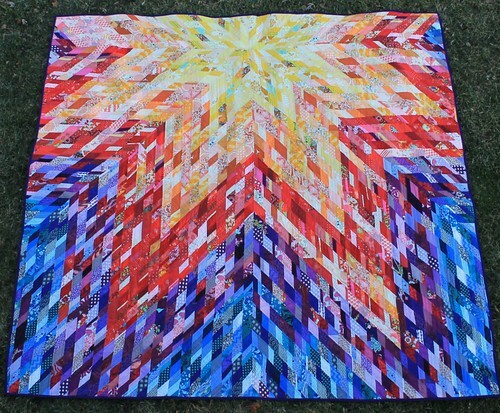 The first is my Rainbow Lonestar Quilt which is also technically a scrappy quilt. 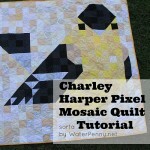 This one is for my scrappy Charley Harper Mosaic Goldfinch quilt! It’s about 6×6 feet. 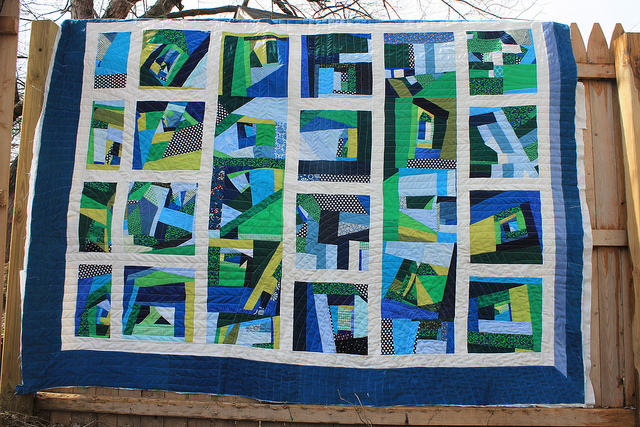 You can find a million other awesome quilts at the Bloggers Quilt Festival and register to win a free sewing machine. Or you can go straight to the Scrappy Entries page and vote for your favorite (It’s ok if you don’t vote for mine, they are all awesome!). 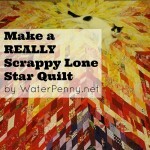 Most of my quilts lately have been scrappy quilts – I love scraps! And I have an unfortunate habit of taking in other people’s scraps too. I don’t like any fabric going to waste, ever! I will save half inch wide strips sometimes, and then I’m like, WAIT, you can’t even sew that. So, I’ve starting throwing those away. Sometimes I’ll be at group sewing events and see people tossing like, half a fat quarter and almost choke to death. I may or may not go through the garbage bins at the end of the day. Feel free to judge me! I can’t help it! I’m about to teach an intro to sewing class and super excited to have some strips of waste fabric available for people to practice sewing straight lines on, so my scrappy attitude is once again vindicated! Ok, but you’re here to see my entry! 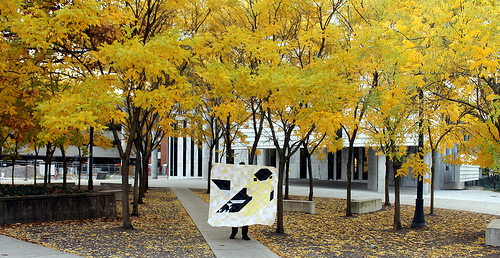 This is one of my Charley Harper Mosaic Quilts. I’m kinda obsessed with Charley Harper! 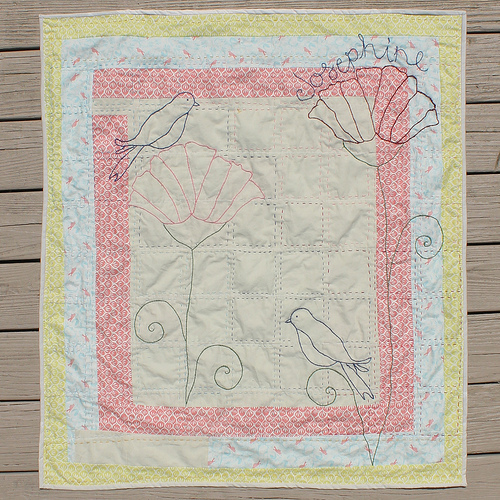 I have a tutorial here and I talk more about the Cardinal Quilt here. I have a lot of neutral scraps because I make wedding quilts which tend include a lot of soft beigey creams. These two quilts just about ran me out of scraps. 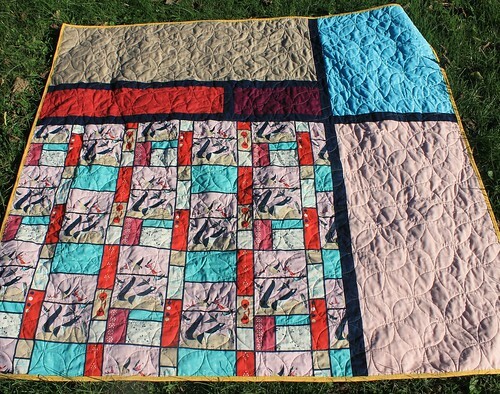 I worked on this quilt over several years. I could NOT decide how to quilt it. 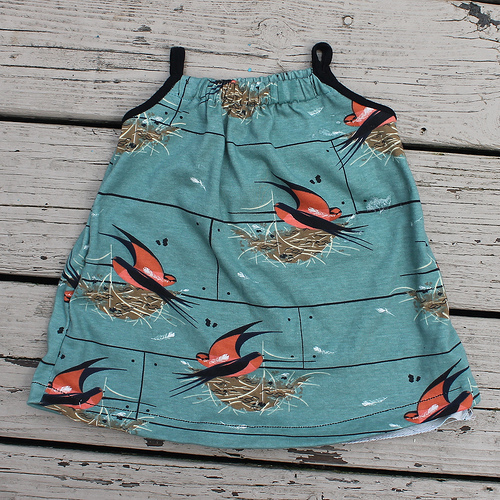 And then I wanted to wait for the Charley Harper fabric to come out. And then I got busy and let them sit in a box for a year. Sigh. 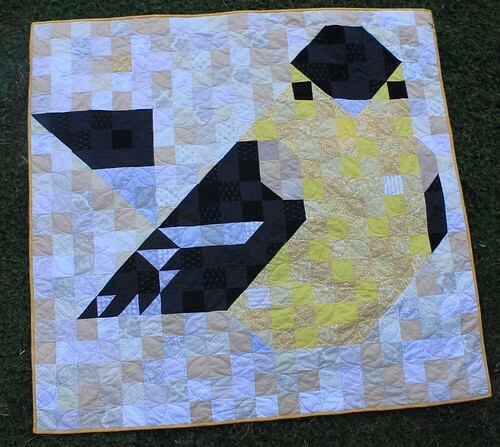 I ended up doing both of my birds with the same Orange Peel quilting pattern (there are a million tutorials for orange peel quilting, but this one is nice!). 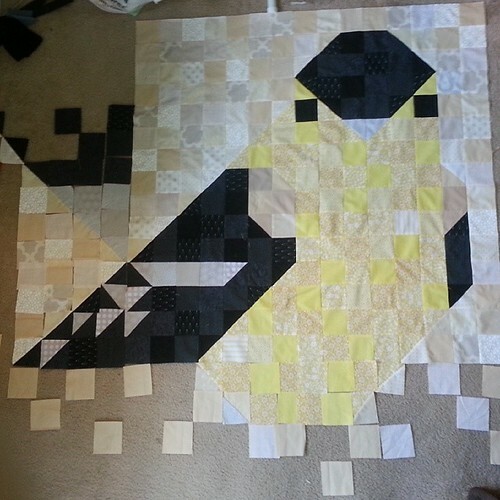 Here is my Goldfinch in progress. Love that curious face! 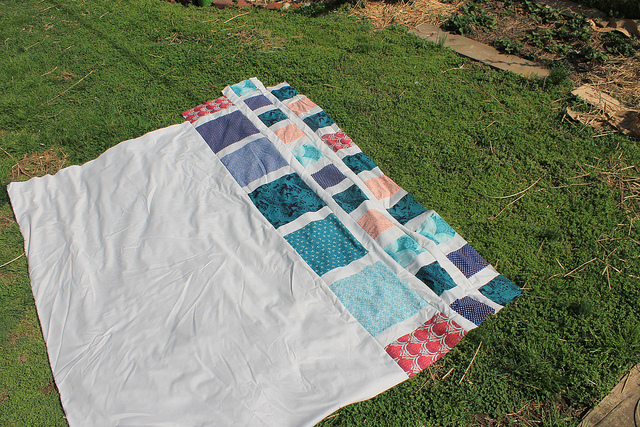 Here is the back of the quilt, which I’m super pleased with. These quilts ended up bigger than they were supposed to be, so I had to add more fabric to make the backing fabric big enough. 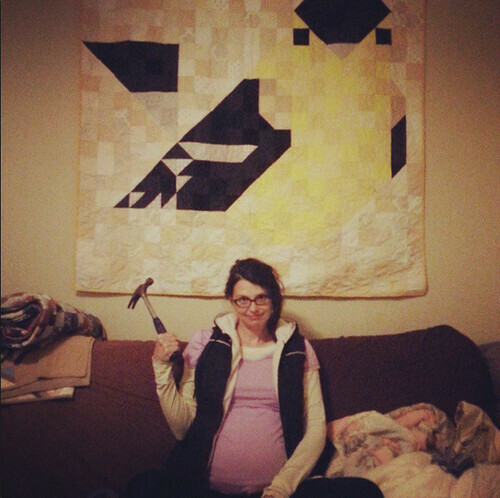 This quilt is hanging in my husband’s office now, which means it makes it’s way into a lot of family photos. Like this one. There used to be a “best quilt photograph” entry at the Bloggers Quilt Festival and I’m so sad I can’t enter this picture into it. If only I had a time machine. 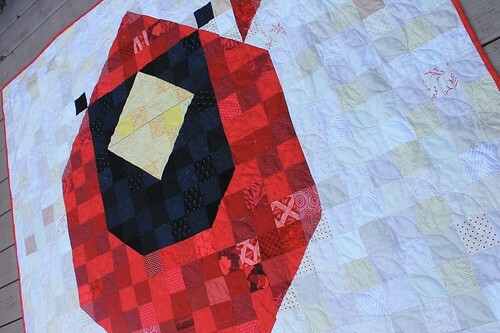 And here’s one last picture that shows the quilting. 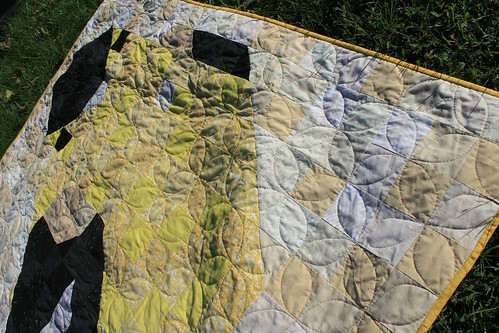 This is such a great use of scraps! 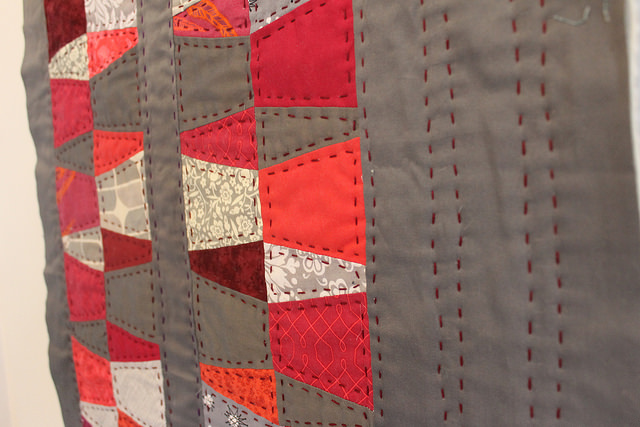 Love the orange peel quilting too. OOOOh, I’m a huge Charley Harper fan too! 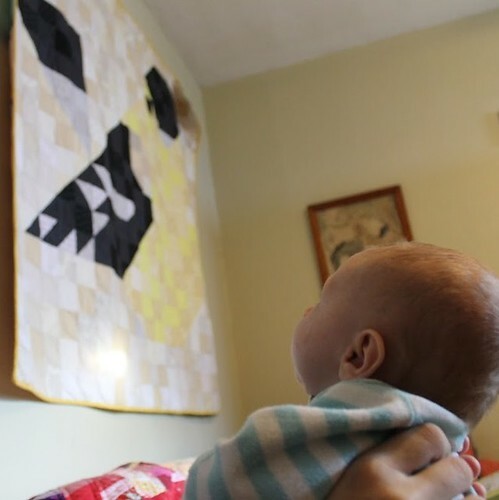 Both quilts (and baby too, of course) are lovely. Thanks for sharing! Very pretty. I love goldfinches.